Scisnack | Big ocean temperature change recorded in tiny fossils! 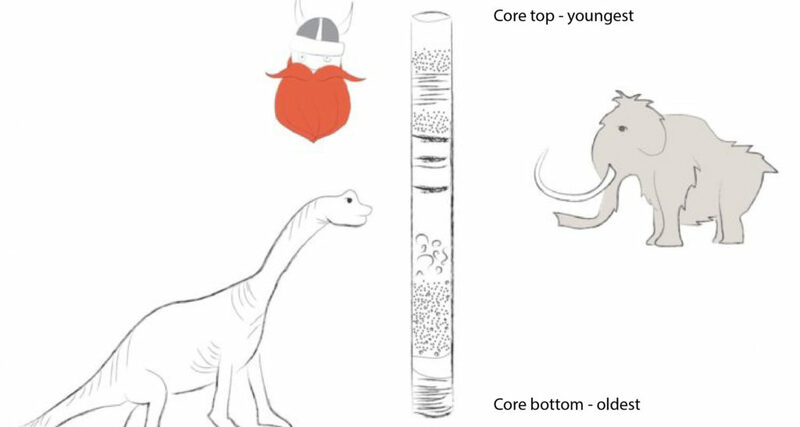 A sediment core is filled with layers of sediment, microfossils, organics and rocks. The layers closest to the ocean water are at the top of the core and are youngest. The deeper the core, the older the deposits. Image drawn by Amandine Tisserand. 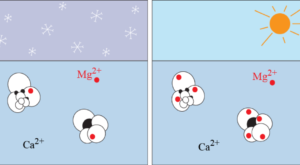 There is more magnesium (Mg) incorporated into the calcium based shell of living foraminifera when the ocean temperature it lives in is warm than when it is cold. Image drawn by Amandine Tisserand. Caprice as she is brought up onto the ship. Photo by Ida Olsen. Some warm Atlantic Water makes it up to the Arctic Ocean. The Arctic Ocean is covered with sea ice and a cool, fresh layer of water. This water is lighter than the warmer Atlantic Water. 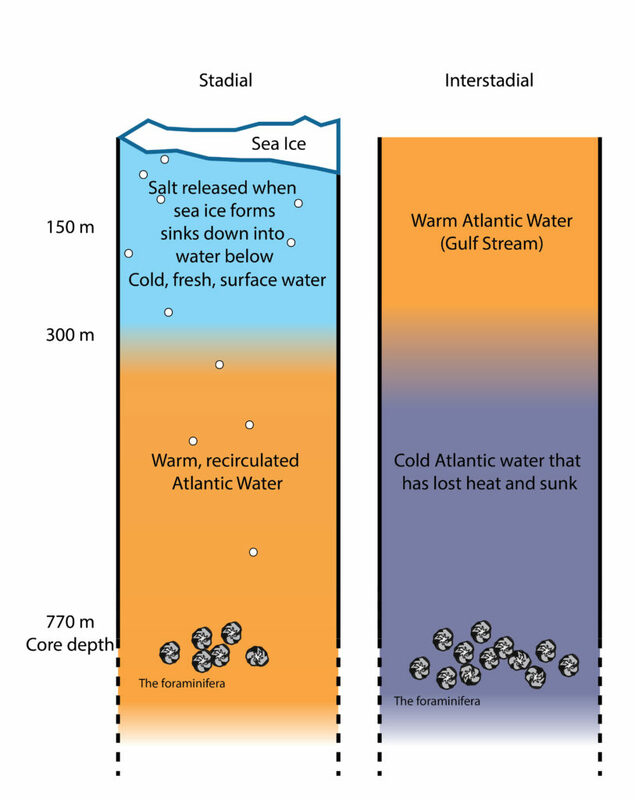 Despite being warmer, the Atlantic Water is forced below the fresh layer because of its higher salt content and therefore density. and exits as intermediate water with a similar temperature as it entered. 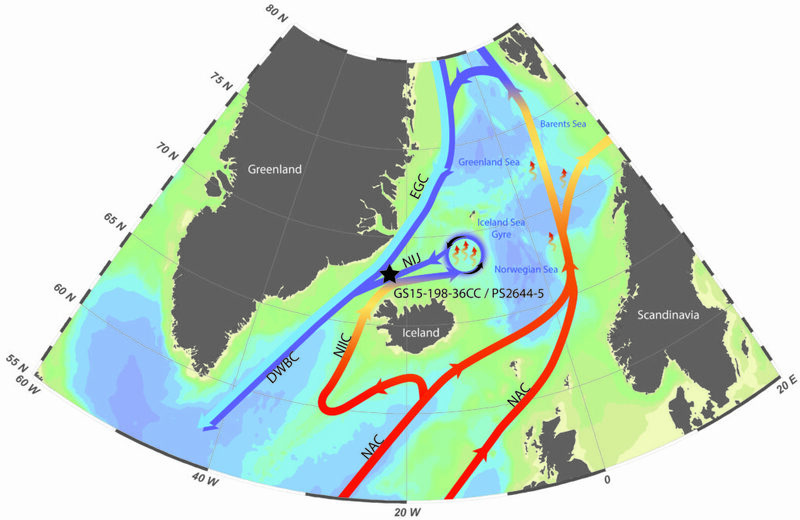 The location of Caprice core (black star) and the main modern currents associated with the Nordic Seas. NAC – North Atlantic Current is often referred to as the Gulf Stream. 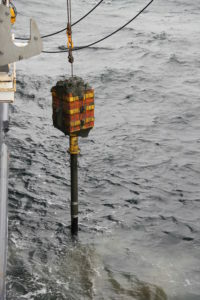 The modern Mg/Ca measurements from this core site for foraminifera living at the sea floor would be cold temperatures related to the DWBC – Deep Western Boundary Current. Image from Sessford et al., 2018. A simple schematic of the water masses in the Denmark Strait during the Dansgaard-Oeschger events. Intermediate Water Temparture record from Mg/Ca measurements of foraminifera in Caprice Core. Sessford, E. G., A. A. Tisserand, B. Risebrobakken, C. Andersson, T. Dokken, and E. Jansen (2018), High-Resolution Benthic Mg/Ca Temperature Record of the Intermediate Water in the Denmark Strait Across D-O Stadial-Interstadial Cycles, Paleoceanography and Paleoclimatology, 33. 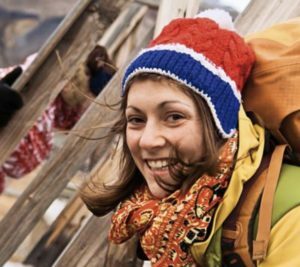 I am a PhD student at the University of Bergen in the Department of Earth Science. I research past ocean climate by using sediment cores. My focus area is the Nordic Seas.